As the long-time avid bookworm that I am, I have been a great admirer of the “Family Library” project launched by Mrs Suzanne Mubarak in the 1980s and running strong till the present. The project places in the hands of the Egyptian reader books of great value written in or translated into Arabic, at eminently low-cost prices. On the personal level, the project has helped me build a major portion of the personal library I had always coveted but was never able to afford. On a recent visit to a Downtown Cairo bookshop to catch up with the most recent Family Library publications I found no new ones, but the bookshop was selling new editions of books printed earlier. As I browsed through the publications, one in particular stood out and captured my surprised attention. This was a 2005 edition of Mohamed, Peace be Upon Him, the Greatest of the Great in the World. The book was written by the Islamic scholar Ahmed Didat who is notorious for his attacks on the Christian faith, and Michael Hart who cited Mohamed as the greatest of 100 persons throughout human history. 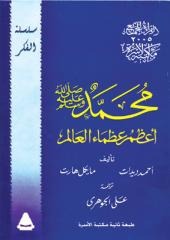 The Arabic translation was made by Ali al-Gohari. It is a puzzle that mystifies many Christians why the glory attributed to Mohamed should be frequently grounded on a comparative debasement of Jesus Christ. This is a major theme that runs through Mohamed, Peace be Upon Him, the Greatest of the Great in the World. Throughout 97 pages, the book introduces articles by Didat in which he staunchly defends Mohamed as the greatest of all. This is perfectly understandable. But what is not understandable is that Jesus Christ is introduced as a racist who describes non-Jews as dogs and pigs (Page 71). Didat uses the verse form (Matt 7: 6): “Give not that which is holy to the dogs, neither cast your pearls before the swine, lest they trample them under their feet, turn and rend you” to prove his point. He accuses Jesus of being a narcissist (Page 72) when He says “The hour has come and the Son of man should be glorified” (John 12: 23). Didat insists Jesus Christ never displayed any mercy. He claims that the words of Christ on the cross “Father, forgive them for they know not what they do” are a mere fabrication by St Luke, because none of the other evangelists reported them (Page 83). The above are a mere sample of the claims and falsifications Didat makes against Christianity which, he alleges, was established by St Paul (Page 26). The book is extremely offensive to Christians, especially in view of the common idea that they would in all probability be denied the opportunity to defend their faith against such allegations. Were the book a private publication, Watani would not have taken issue with it. After all, the streets and bookshops of Cairo—and most Egyptian towns—are chockfull of books, booklets, tapes and CDs which exalt Islam and disdain Christianity. But Mohamed, Peace be Upon Him, the Greatest of the Great in the World, as proudly announced on its second page, is the joint effort of the Culture Ministry, the Media Ministry, the Education Ministry, the Ministry of Local Development, and the Ministry of Youth. The price for the public is a petty two Egyptian pounds meaning that, as with all the Family Library publications, the book is heavily subsidised by the State. The question which begs an answer is how such a book serves the cause of citizenship rights? Do all the venerable institutions which joined ranks to produce it believe it is right to offend the Christians of the same homeland? We have never demanded, nor will we ever do, that any book or thought should be confiscated. We believe ideas can only be refuted by counter-ideas. As Egyptian Christians, we demand our right to defend our faith against the allegations included in the Family Library’s Mohamed, Peace be Upon Him, the Greatest of the Great in the World by being granted the opportunity to compile a book to be released by the same Family Library series. After all, Family Library books carry on their back cover the picture of their sponsor Mrs Suzanne Mubarak, the wife of President Hosni Mubarak who always describes himself as the defender of all Egyptians, Muslims as well as Christians.